Proper Station Grounding is Important! AC safety: protects against shock hazards from ac-powered equipment by providing a safe path for current when a fault in wiring or insulation occurs. Lightning protection: keeps all equipment at the same voltage during transients from lighting and dissipate the lightning’s charge in the Earth, routing it away from equipment. RF management: prevents unwanted RF currents and voltages from disrupting the normal functions of equipment (also known as RF interference or RFI). 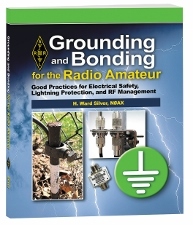 Grounding and Bonding for the Radio Amateur shows you how to make sure your station follows current standards for lightning protection and communication systems, not to mention the National Electrical Code. You’ll learn effective grounding and bonding techniques for home stations, including condos and apartments, portable and temporary stations, as well as towers and outside antennas. Grounding and Bonding for the Radio Amateur. Kindle Edition.